11 Unusual Bouquets on UA-flowers.com! Home/News/11 Unusual Bouquets on UA-flowers.com! Let us amaze you with our TOP 11 unusual bouquets! Bright, tender, juicy, sweet, in baskets and without ones. Wonderful fresh flowers for everyone! Here they are! The bouquet "For My Love" is made of large pale-pink gerberas beautifully combined with graceful eustomas, delicate silky petals of which conceal a mysterious purple depth of each flower carefully. The cute fluffy balls of chrysanthemums tone with the green foliage and create a soft background with the thin sprigs bent under the weight of tiny buds rising over it here and there. The shy pink roses and chrysanthemums glance at you from behind the white gerberas and orange carnations. 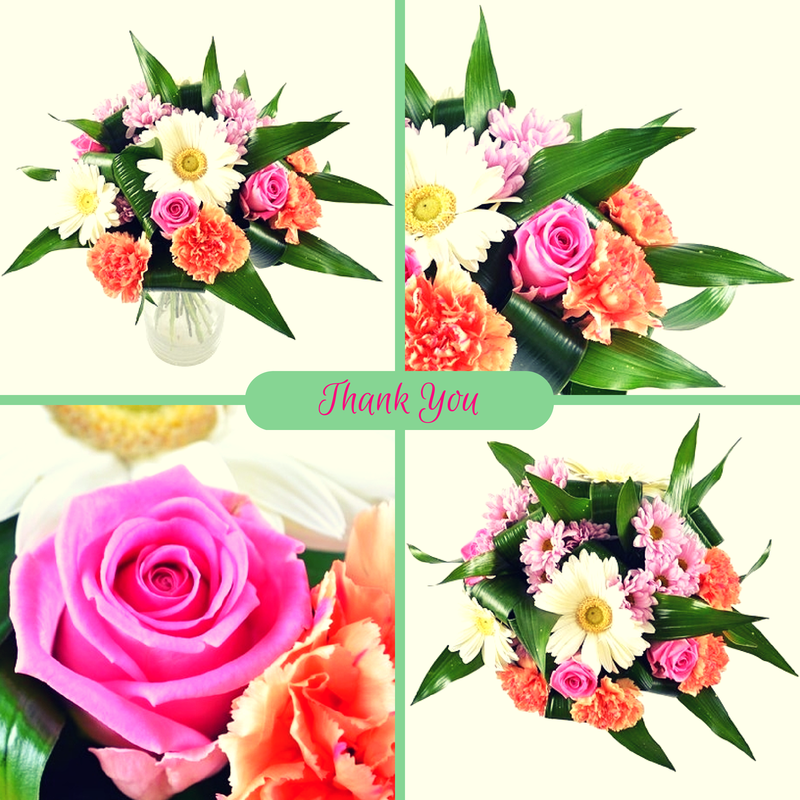 The cheerful variety of colors of this composition makes it possible to present the bouquet for any occasion and to anyone: your second half, grandmother, mother, friend or boss. 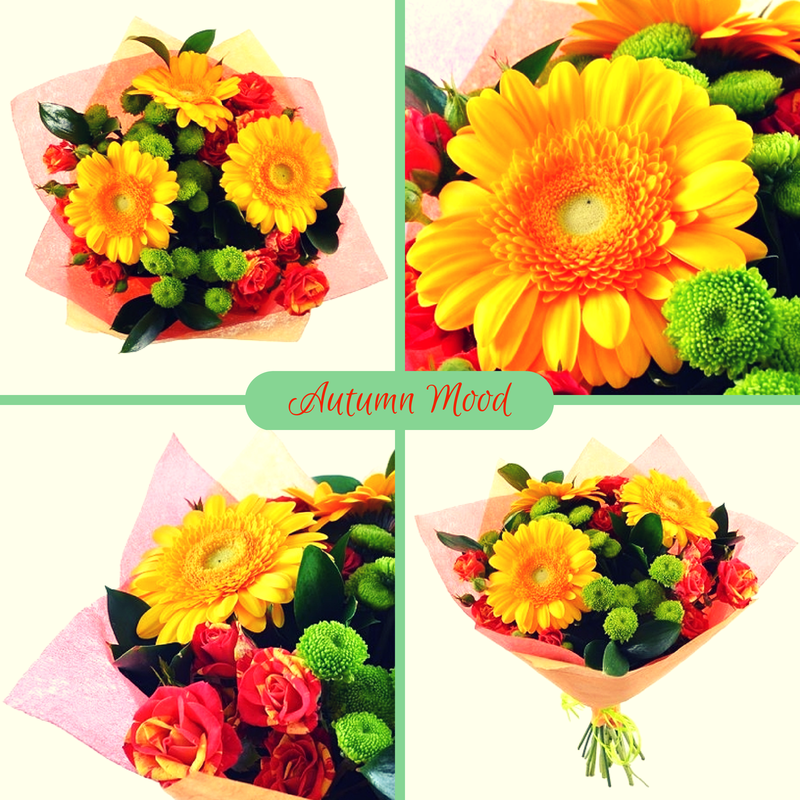 The gold of autumn, the combination of yellow, orange and red colors on a background of green - you can find all of this in our bouquet. This gift is almost universal – it is suitable for men, women and children. The bright large gerberas remind of the past summer with its hot sun, the green chrysanthemums are so similar with juicy fresh grass on the lawn. The amazingly beautiful and original bouquet is made of wine red carnations, white roses, orange chrysanthemums with greenery and thin twigs of beargrass. Rich colors of the composition are pleasing to the eye and make one sense the fullness of life. 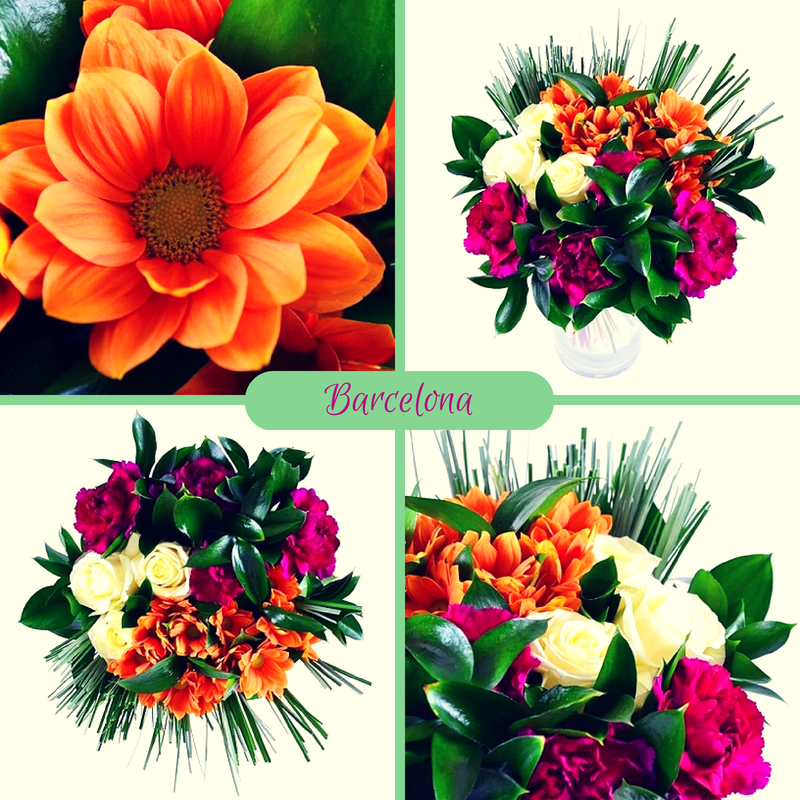 The bouquet "Barcelona" is the perfect way to wish happy birthday, name day, or any other occasion. This original composition consists of pink chrysanthemums and roses, purple carnations, white gerberas and large rich leaves of aspidistra. 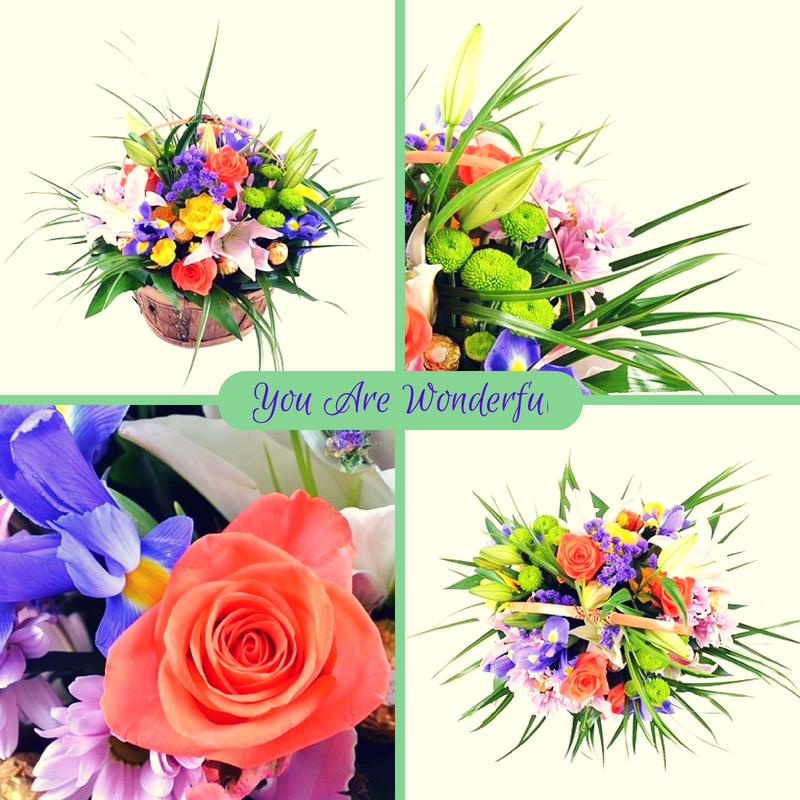 The colorful bouquet makes you feel like admiring and enjoying it!.. Amazing bouquet-confession, bouquet-compliment "You Are Wonderful" is made of pink lilies and chrysanthemums, purple irises and statice, green chrysanthemums, orange and yellow roses, emerald greenery and Ferrero Rocher chocolates in shiny wrappers so similar to fabulous golden nuts. It is a bouquet-rainbow, a bouquet-fireworks, a bouquet-joy! 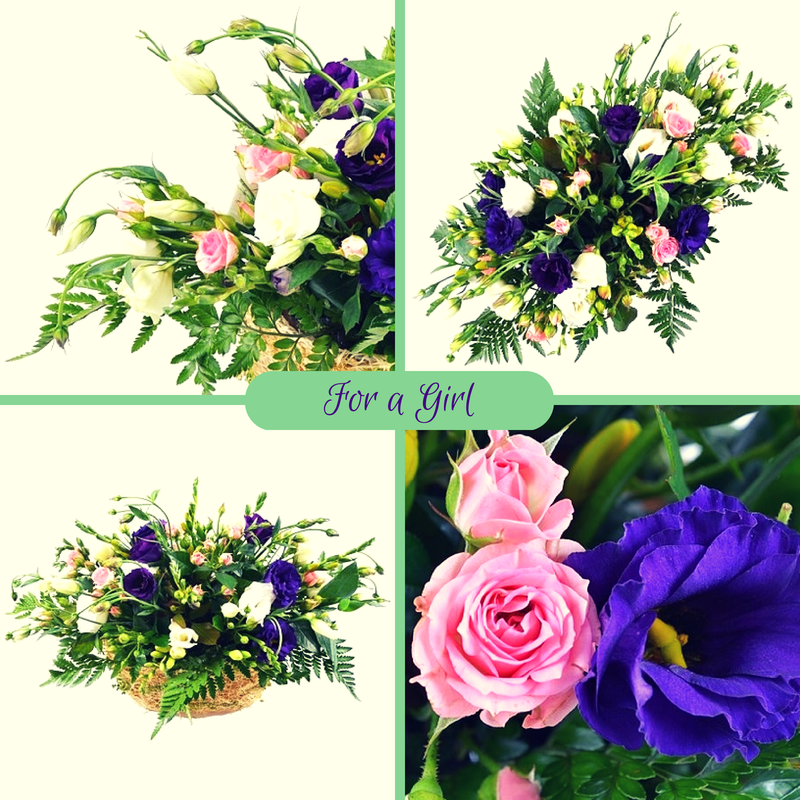 This bouquet is perfect for both a woman and a friend- or a coworker-man. The bright-scarlet roses do not solo here, they just tint the bouquet a little. The main flowers in this composition are the delicate milky lilies. Their whiteness is emphasized by the light chrysanthemums while heads-caps of lettuce-green color add a note of freshness and tone with the veins of the lilies of similar color. 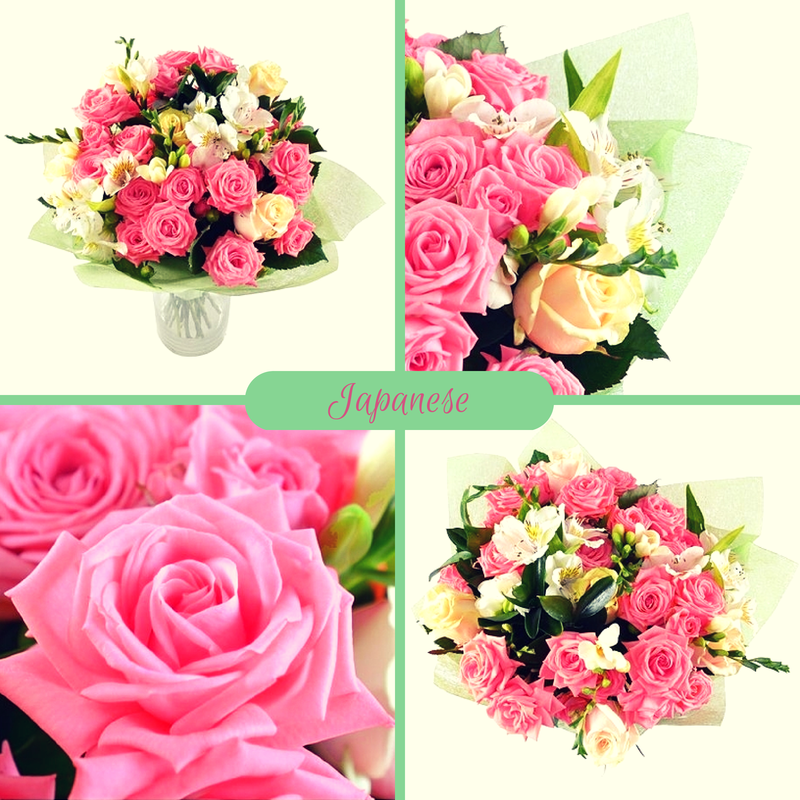 The color gamut of the bouquet with the oriental title "Japanese" is created by large spray roses of cherry tree color. The gorgeous tight buds of delicate cream color tone with them perfectly. This exquisite present can be granted on the first date, Valentine's Day, Mother's Day, anniversary, christening, Women’s Day. 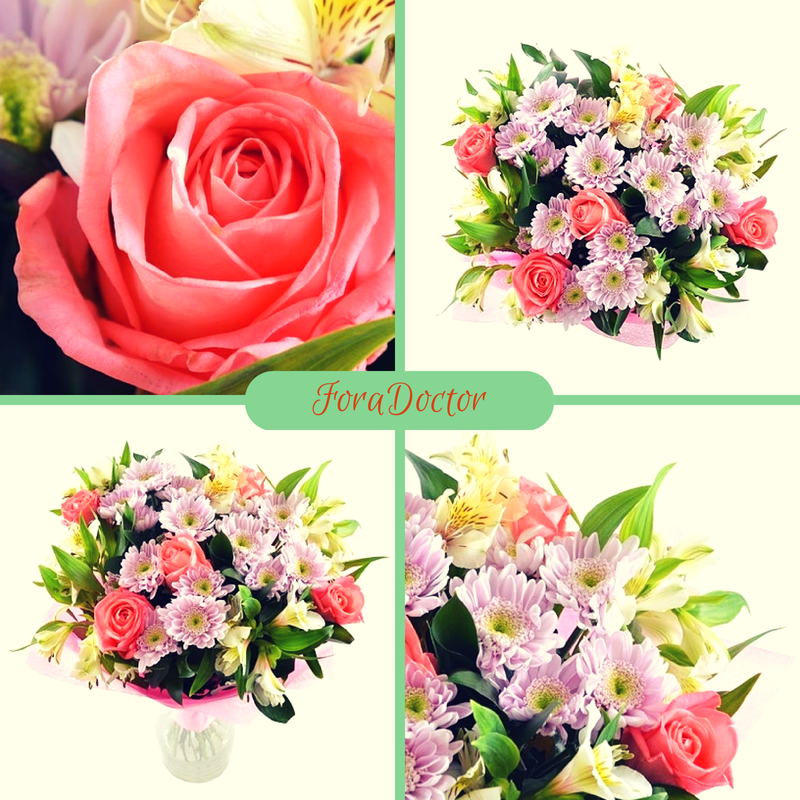 The delicate combination of pastel colors of the bouquet "For а Doctor" looks very harmonious. The composition is made of roses of astonishing coral color, soft and touching pink chrysanthemums and pure snow-white alstroemerias. When you get tired of classical red roses, when the tenderness of ox-eye daisies seems too naïve, when you long for simplicity but at the same time genuine surprise in the eyes of your beloved girl, it is high time for this composition. Snow-white eustoma and white (but with a touch of precious opal) freesia interwoven with weightless pink buds of spray roses create the basis of the canvas on which the sudden bright strokes have painted the awfully purple lisianthuses. 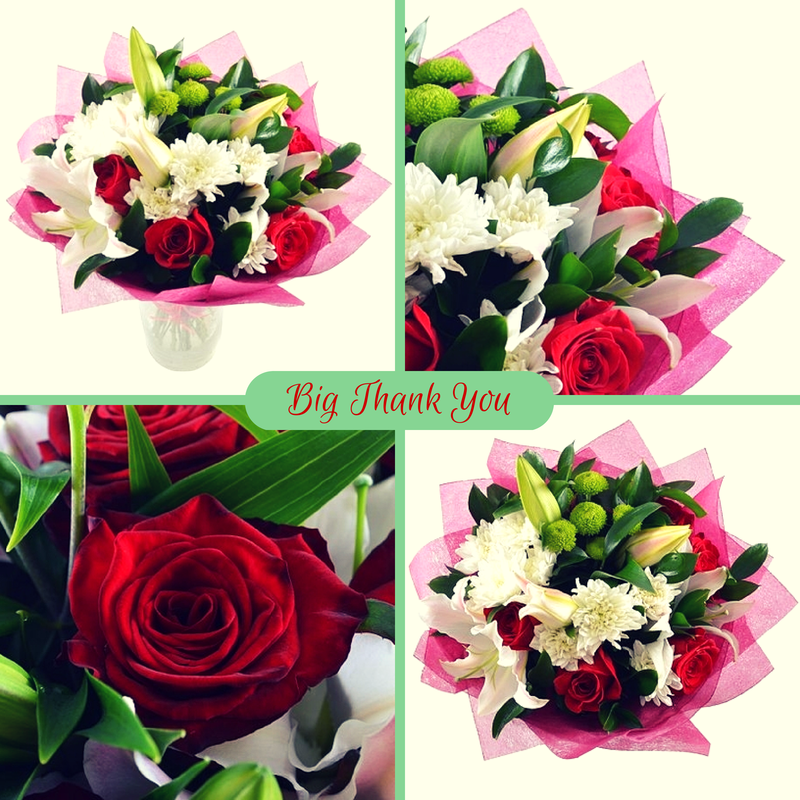 When you present someone with flowers you can always be sure that this gift will please the one who gets it. And if while choosing a bouquet you take into account the symbolism of flowers it can be a very valuable gift. 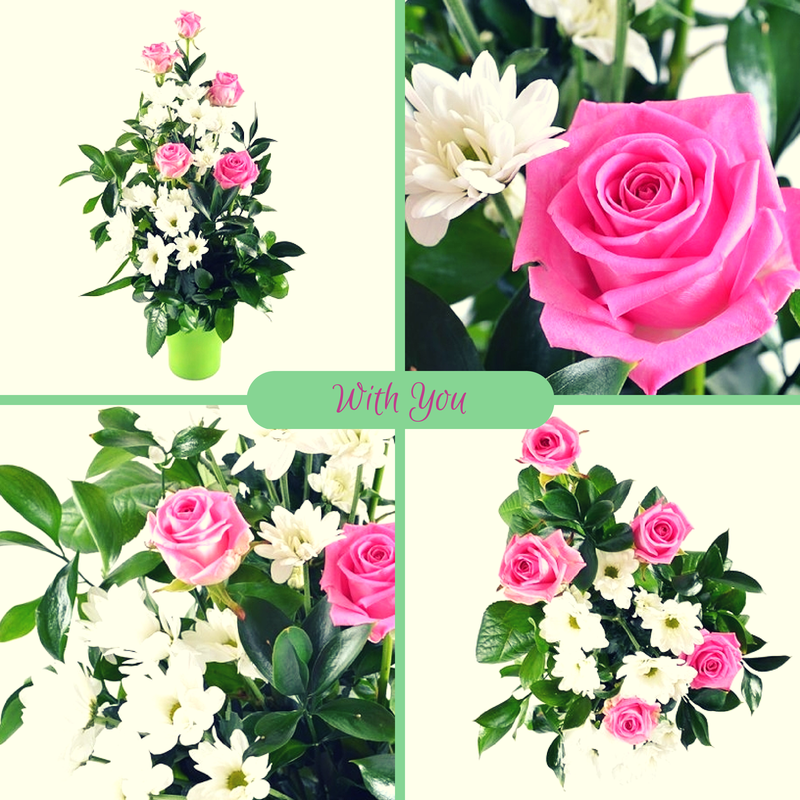 Roses are classical flowers suitable for any occasion. Few things which can help you to break through the walls of the limitations and be happy. 2014-07-02Psychological research: how flowers reveal character of a man? Psychological researches have shown that the color of the bouquet can tell about the character of the man who presented it. Read on our infographics to know more about what flowers people prefer to give. 2014-06-22Give your favorite bright summer with UFL. The brightest colors of summer flowers we gathered in wonderful bouquets for your favorite! 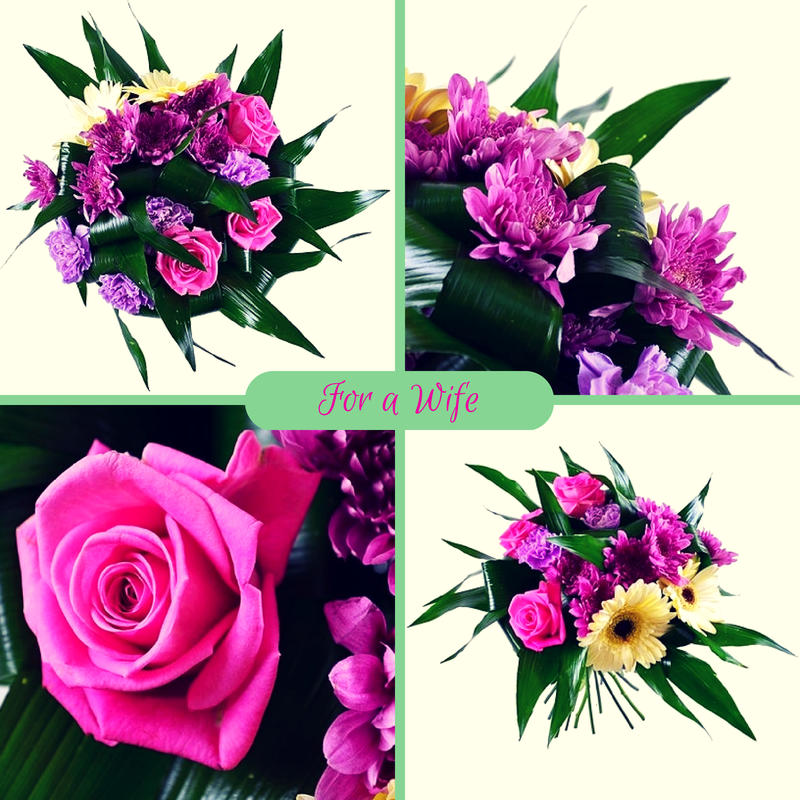 UFL offers you the richest selection of flowers for those who are dear to you. 2014-03-26Test of versions of the site UA-Flowers.com is successfully completed! The work of full and mobile versions of site UA-Flowers.com has been successfully tested on different devices and systems!